With the monster-nostalgia craze still going into the early '70s, it was inevitable that cereal makers would want to get in on the action. General Mills came out with two monster-themed cereals in '71: Count Chocula and Franken Berry. Boo Berry didn't come along until 1973 and Fruit Brute followed in '74. Fruit Brute was cancelled in '83 and replaced with the short-lived Yummy Mummy. Unfortunately, most stores only order them around Halloween, but the scarcity has made them even more popular and a vital part of a lot of Halloween seasons. With his accent and turned up collar, Chocula is heavily inspired by Bela Lugosi's Dracula. 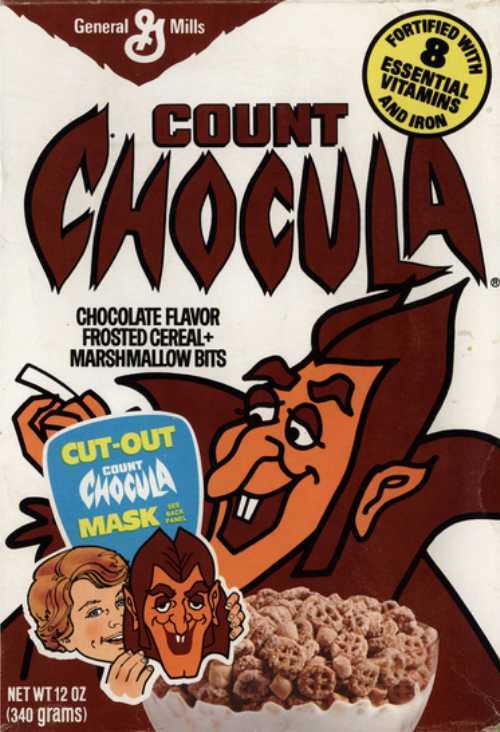 I actually prefer to eat Franken Berry and Boo Berry - just because chocolate cereal is so easy to get the rest of the year - but it's not Halloween until we've polished off a box of the Count's flavor too. Also, I wasn't aware of Yummy Mummy; what flavor were they going for with that one? All great flavors. They should bring back Yummy Mummy or Fruit Brute, as well, since they only make them once a year now, anyways! I never had these cereals growing up, but I have seen them in the grocery store every now and then. I do like the starkness of the original boxes, white, with just the mascot and the cereal. No distractions, just what mattered, I like that. Theres a blog called "Cereal Killers" that dreams up some monster cereals of their own, some actually look pretty good, like "Post Moder-MMMs"
Teebore, if memory serves, Fruit Brute and Yummy Mummy were generic "fruit" flavor, sort of like Fruit Loops or Trix. That's probably why they didn't do so well.